Submissions have been closed, and voting begins tomorrow May 1. There were 147 submissions in the amateur category for this contest, and in the voting pages, my quilt is currently listed at #144 (page 24 of the gallery view, I think). I encourage y'all to go to the main page for the amateur contest and check out all of the entrants and vote for your fave(s). For more information about rules and to view entries in the professional category as well, visit the contest home page. Fat Quarter Idol at Sew, Mama, Sew! So, a little respite here. Have you all seen the weekly contests going on over on the Sew, Mama, Sew! blog?? This is one of those contests that is purely FUN. No putting your own creations on the line, no crazy deadlines, just playing with fabric swatches within a stated theme. And isn't that one of the things that drives us quilters to the medium? This week's theme is "Meet me at the Picnic." I had fun choosing my 12 prints from their fabric selections. All you have to do to participate is create a Pinterest board (according to their specifications) and post to their blog page for that week's theme. 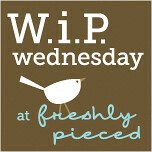 WIP Wednesday - is it already?? I also started cutting fabrics for another bee block - the February round of Friends + Fabric for Maria... gotta love that aqua and orange! My one last WIP that I actually worked on this week is of the knitty variety. Working on that hood by Lee Meredith, fellow Portlander. I first posted about it here. I'm linking up to Lee at Freshly Pieced, so hop on over and get the skinny on everyone else's creative pursuits! I'm feeling a little gun-shy about cutting up the blocks before I can envision the various combinations, so earlier today I was playing around with the stacks until I came up with 4 groupings that I think I like together. And though it was difficult to find a fabric to tie together the tangerine/orange with that deep wine color, when I found it I knew, and that Denyse Schmidt Hope Valley print on the bottom is just the link! Hope to begin cutting into these guys by Thursday or Friday. As promised, I'm going to fill in a few more details on my journey through this challenge, which I have since learned I did not place in, but one of my fellow Portland Modern Quilt Guild members, Jill, did! See her fabulous entry here and here. The design process began, as most do for me, with a piece of graph paper and a pencil - oh, and the original theme of the challenge, of course. The first design was in my awesome graph paper composition notebook, but as I was playing with ideas I realized this quilt wanted to be based on 60 degree triangles, which meant switching the type of graph paper I was using. Thank goodness for the options we have! I've talked about the fabric selection process a bit in previous posts, so I won't go too much in depth here. Plus, there's nothing too complex about it. Bluntly, this challenge came about at a time when I was making a concerted effort to limit my fabric purchases to specific projects, and knowing I was going scrappy for this, I started out in my stash. Choosing from a color that I seemed to have a fair amount of fabrics in a variety of values made the most sense to me, and so that's where I began. And then I just started making strip sets, selecting sub-sets of gradients within the full "spectrum" of values with which I was working. Those strip sets got cut down at 60 degree triangles and from the dozens and dozens of such triangles I started laying them out and sewing them back together according to the layout in the sketch. Now, one of the new techniques this project introduced me to was binding the serrated edge. When I have a bit more concentration (admittedly, we are watching "Dangeroud Liasons" while I am doing this - an excellent film that neither J nor I has seen in YEARS) I'll try to put together a tutorial on the binding process, but for now I'll just load several of my photos from the experience. and like my little "binding cozy"? Just a swatch from an old knitting project and a safety pin, and it keeps the long bias binding roll in check, while allowing it to unroll as I use it. Yay for scraps of all kinds! So, I guess I've been holding out on sharing much about my first major entry to a quilt contest. Some might say I play by the rules, and those same folks would also say that I take thing rather literally. And both are more or less true. I did, once before, enter a quilt into a contest, or rather a juried exhibition. It was only a couple of years after I had started quilting, and though I still stand by the inspiration and theme of the quilt, I acknowledge that the technical aspects were not exactly museum worthy. I was looking for ways to combine my relatively newly discovered love of quilting with my more steady, consistent love for photography. It is a black and white "Trip Around the World," both literally and figuratively. and started building out from there. My first step was playing around in the sketchbook, and the first design I came up with, I figured was both more complex than I wanted to try for this, and would perhaps not be best realized as a monochromatic quilt. So I played some more and came up with a quilt based primarily on scrappy, string-pieced patches. After much playing around and adding to the fabric pool, I landed on what worked best for me.